An upgraded hotel close to Amsterdam RAI with easy access to Schiphol Airport and central sights.Holiday Inn® Amsterdam is located near the A10 Amsterdam ring road. Amsterdam Airport Schiphol is only 14 kilometres away from the hotel. Business district Zuidas and the RAI Exhibition centre are just around the corner. The RAI train station is within 3 minutes walking distance and offers a direct train connection to Schiphol. The metro or tram brings you within 15 minutes to the city centre of Amsterdam.The hotel owns a private paid parking place for 30 carsHoliday Inn Amsterdam has all the facilities that 21st century business meetings need. The 11 multi-functional meeting facilities offer space for up to 450 persons (total of 690 m²). All meeting rooms have natural daylight and air-conditioning. Regardless of the scale of the event you are always given a high level of genuine service and attention to details, for which the Holiday Inn Amsterdam is famous.When work is done, you can mingle in the inviting Open Lobby with its Starbucks coffee corners, bar offering Dutch beer, and international kitchen whipping up tasty meals. Retreat to a spacious, new, light-filled guest room, or choose a refurbished Executive Room with superb views. At this hotel you can enjoy:- Free WiFi- A 24-hour fitness centre- Private parking for a fee Friendly staff are always on hand, whether you wish to rent a bicycle or book a guided tour of the canals. Want to have some fun? Play a game of table football in our Game Corner. Still have energy to burn? Amstelpark – one of Amsterdam’s most beautiful green spaces – is just across the street. 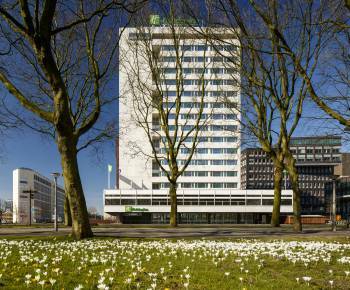 Holiday Inn Amsterdam has all the facilities that 21st century business meetings need. The 11 multi-functional meeting facilities offer space for up to 450 persons (total of 690 m²). All meeting rooms have natural daylight and air-conditioning. Regardless of the scale of the event you are always given a high level of genuine service and attention to details, for which the Holiday Inn Amsterdam is famous.